Advances in inspection technology typically migrate to food and beverage from other industries, but in the case of near-infrared (NIR) spectroscopy, consumer electronics may bring the next breakthrough. It wouldn’t be the first time. Computer gaming laid the groundwork for simulation models that take the guesswork out of process changes and construction projects. In the case of NIR, a miniaturized spectrometer for soil analysis in agriculture likely will be integrated into in-line inspection systems within a year, thanks to price reductions made possible by smart phones. Benchtop spectrometers costing six figures now are complemented by portable units costing five figures for material quantification. Various wavelengths in the electromagnetic spectrum can be used, but the NIR region offers several advantages, including deeper penetration into a sample than mid-infrared light waves. Accuracy in parts per million feedback may not be as great, but it is precise enough to find a home in process analytic technology used in pharmaceutical production. As costs have declined, multinational food companies such as Nestle, McCormick, Kraft and Cargill have deployed NIR spectrometers. Applications include monitoring moisture content in coffee beans, brix in orange juice and fat and moisture levels in meat. A spectrometer system from tec5USA, Plainview, N.Y., can penetrate an apple with a beam of light to detect rot or a hollow interior. Miniaturization of hardware has played a prominent role in affordability for spectrometry. Room-sized systems gave way to benchtop spectrometers and then briefcase-sized units that can be attached to blenders and other equipment. Besides the software and processors that analyze reflected or absorbed light to determine a material’s composition, the spectrometer itself includes a light source, mirrors, a laser, beam splitter and interferometer, where spectral encoding occurs. Miniaturization is taking a giant leap forward. Using semiconductor-style wafers and etching techniques that put movable mirrors and other components on a chip, three firms – Cairo, Egypt-based Si-Ware Systems, Spectral Engines Oy in Finland, and Consumer Physics in Tel Aviv, Israel – have shrunk a functioning spectrometer to the size of a TicTac box. The units are integrated into some industrial instrumentation already, but the developers are focusing on smart phone manufacturers to integrate their NIR spectral sensors, either as an attached component or built into the phone itself. Besides giving consumers the ability to scan produce and other food to identify the presence or absence of specific components, such as allergens, those sensors would have to be mass produced, driving costs well below $100. “Using semiconductor components for Fourier-Transform NIR spectroscopy, we’re able to provide a dramatically smaller and dramatically lower-priced spectrometer,” says Scott Smyses, executive vice president-worldwide marketing & business development at Si-Ware (www.si-ware.com), which has offices in the Los Angeles area. The electronics, photo detector and chip packed into Si-Ware’s sensor generates raw data that must be analyzed, which is why the firm is in discussions with instrumentation companies that already provide NIR systems for in-line, nondestructive inspection of food and other materials. NIR sensors already are justifying their cost in food plants; one vendor reports that a customer realized a payback in less than two months for a system that flagged product with water content below the targeted threshold, allowing the processor to boost yield. But unless a feedback loop enables automatic adjustment upstream to correct product drift, human reaction is required. Not so with vision-based sortation systems. Some of the industry’s most automated processing facilities handle potatoes, nuts, berries and citrus products. Vision systems replaced most eyes decades ago for grading and foreign-material identification. As those systems have advanced, robotics and digital sortation equipment have largely replaced people in some operations. Clementines are an example. In recent years, Fowler Packing Co. and Paramount Citrus Packing Co., suppliers of virtually all bagged clementines sold in North America, have built highly automated packing houses. Graders from New Zealand-based Compac perform visual and density inspection at both Fowler’s Fresno, Calif., facility, which processes 450,000 bags a day, and at Paramount’s Delano, Calif., plant, which opened in 2012 and represented a $200 million investment by Roll Global. Throughput volume could not be sustained with labor, which is too expensive and too scarce anyway to sustain production of fruits and vegetables. Vision inspection serves both a quarterback function for the line and a supplier grading tool. If surface defects or product dimensions exceed standards, the inspection system provides the data needed to address the problem with the supplier. Customer requirements compel some processors to adopt zero-tolerance policies toward foreign materials. To meet those specs, the product makes multiple passes through the sorter. That raises the likelihood of product degradation. Frozen cranberries are brittle, and the less handling, the better. Emblème Canneberge in Bourgeois, Quebec, wanted to minimize damage to the 30,000 lbs. of frozen berries it sorts per hour, president Vincent Godin explains, so it recently commissioned a sorter that layers multiple images in a single pass to remove contaminants and defective berries with minimal false rejects. Emblème Canneberge employs a sorter from Key Technology Inc. (www.key.net), Walla Walla, Wash., that combines pixels from up to eight lasers and four cameras in a single image of each piece of fruit. Emblème’s frozen cranberries arrive through a chute; if product was fed on a belt, the berries would become airborne when they reached the sorter’s field of vision, providing a 360° view. Prior generations of Key sorters required separate top and bottom image capture. “You were able to make decisions at the object level, but you didn’t have the ability to combine that information at the pixel level,” explains Marco Azzaretti, Key’s product manager-advanced inspection systems. The firm refers to the multi-channel imaging system as pixel fusion. The “heart of the machine” is a CPU that can process huge amounts of data in nanoseconds. “It has to be able to process instantaneously,” says Azzaretti. “It sees everything in the process but uses only a fraction of it in the sort.” Data analytics on line performance, quality trends and other metrics is pointing the technology toward predictive functions, he concludes. Contaminant detection ranks as the most automated approach to product inspection. Metal detectors and X-ray machines have a decades-long track record in end-of-line inspection, with X-ray units gradually becoming the standard for the largest food & beverage companies. X-ray’s ability to detect a wide range of contaminants is driving the shift, with factors such as increased use of metalized film adding additional impetus. But X-ray machines can be overkill when ferrous and nonferrous metals constitute the vast majority of product contaminants. Even when final inspection is done with X-ray, metal detectors increasingly are positioned upstream in production. The good news is that metal detector technology continues to advance, with Thermo Fisher Scientific’s five-frequency machine the most recent example. Introduced to the industry at September’s PackExpo Las Vegas trade show, Thermo’s Sentinel metal detector generates five frequencies of electromagnetic waves simultaneously. Multi-frequency metal detectors were introduced a decade ago, but they only operate on one frequency at a time, according to Bob Ries, lead product manager-metal detection & X-ray inspection at Thermo Fisher (www.thermofisher.com/us), Minneapolis. The Sentinel unit continuously scans the frequencies, switching from one to the next every millisecond. Strictly speaking, that constitutes semi-continuous scanning, but it means multiple wavelengths at each frequency scans product every second. The final opportunity for automatic inspection immediately follows metal or X-ray detection: checkweighing. Deviations as minute as 10mg between measured and actual weight can be achieved with checkweighers, though that requires slow line speed. At throughput rates up to 600 packages a minute, variances of 0.5g are more realistic, a deviation most manufacturers can live with. Sanitary design is a more immediate need for improvement. 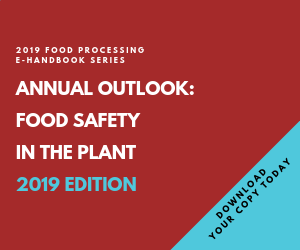 The ANSI B155.1 standard for packaging and processing equipment was revised recently to require hygienic risk assessments, along with electrical and mechanical risk assessments. Anticipating the change, some food manufacturers already were including hygienic risk in their RFPs, reports John Uber, product management leader at Mettler Toledo Checkweighing (www.mt.com). In September, Mettler-Toledo rolled out its C series of checkweighers, a good-better-best assortment with four levels of hygienic design. An IP54 rating accompanies the base platform, the only machine with some aluminum components. The other platforms carry IP65, IP66 and IP69 ratings, depending on how aggressive the washdown conditions are. All parts are stainless steel or polymer. “It’s our oldest automated inspection line but the first to implement sanitary design,” says Uber. Rounded or canted plains replace flat surfaces, and easy disassembly for cleaning was an engineering requirement. To provide a turnkey solution, Mettler-Toledo fabricates clear plastic machine guarding featuring a gabled cover over the product zone to draw moisture away. The PackML standard has been embedded in the company’s checkweigher controls for nine years. “It’s a common language, and when every machine in the line is talking the same language, you get unbiased data for OEE measurement,” he points out. For food companies that have adopted PackML, there are numerous advantages. For example, one international food company using PackML remotely downloads controls code for checkweighers placed into service anywhere in the world. “In five minutes, the checkweigher is integrated in the line,” says Uber. Checkweighers and metal detectors lack the glamour of multi-channel vision graders and spectrometer-on-a-chip. Nonetheless, as demands for higher speeds and accuracy clash with requirements for safe and contaminant-free finished goods, the performance of automated inspection systems is advancing to reconcile them.